Today’s election has many Swarthmore students wishing clean energy were a priority for the presidential candidates. But on campus, we need not look far to find students that are fighting for our environment, like the members of Swat Mountain Justice (SMJ). Despite some discouraging meetings with administrators and Managers last spring, SMJ continues to seek support for the divestment of Swarthmore’s endowment from the fossil-fuel industry. The student group is optimistic about the divestment movement’s expansion outside the college’s campus, but it also anticipates an uphill battle against a lack of student enthusiasm and–more importantly–the administration’s conviction that divestment is neither an appropriate nor an effective tactic. The group’s agenda for this semester has included the familiarization of first-year students with the history of the divestment campaign and the organization of a trip to West Virginia. There, they learned about mountaintop removal, a method of coal mining controversial for its potentially destructive effects on local communities and ecosystems. But even as the club strives for more support from the community, the administration remains resolute that SMJ is heading in the wrong direction. Considering [that the College has become a leader in sustainability], I find it contradictory that Swarthmore invests its endowment—and therefore alumni donations—in the fossil fuel industry . . . Reliance on fossil fuels is an environmental and human rights crisis that demands bold action. 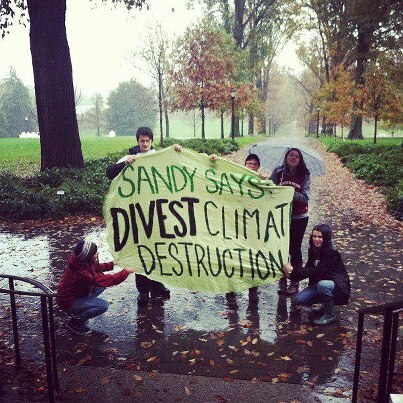 I ask that Swarthmore divest its endowment from the fossil fuel industry. SMJ released a similar petition—directed at the student body—last spring. That petition garnered 700 signatures (representing approximately half of the students who were on-campus at the time, according to Walsh) in a two-week period. Interested students first took trips to West Virginia in spring 2010, Walsh said, and they sparked the founding of SMJ. “Students were really motivated by the people that they spoke to and the stories that they heard, and wanted to form a continuous group against mountaintop coal mining on Swarthmore’s campus,” he said. Since then, SMJ has broadened its view to looking at all forms of fossil-fuel extraction and connecting it with the broader issue of climate change, but also recognizing that its roots are in extraction practices, which are hurting people who are right there. Despite the group’s continued efforts to cultivate concern for those directly impacted by fossil-fuel extraction (and the broad support indicated by the success of its student petition), there may yet remain a dearth of interest among students in the divestment campaign’s core financial aspect. Walsh says the student body doesn’t concern itself with the endowment. However, Walsh is optimistic that SMJ’s actions have indeed made progress in this regard. “Since Mountain Justice has started raising concerns over our endowment, however, I think more students are realizing that Swarthmore’s investments should be discussed and examined with a critical eye,” said Walsh. The administration, for its part, has also been “exploring initiatives in which the College can increase its impact,” according to Welsh. She said that the College’s future initiatives might include direct cooperation with Ceres (an advocacy group for corporate leadership in sustainability) or affiliated organizations. She said the Committee on Investor Responsibility is focusing on sustainability issues this year. Walsh criticized the thin playbook of the Committee on Investor Responsibility (CIR). But Earthlust member Ben Goloff ’15 took a more cautious stance. Walsh would like to see SMJ host a conference that brings these efforts together. Update since the time that the interviews were conducted for this article: there are actually about 50 schools with divestment campaigns right now, and a couple that have already decided to divest! The movement is gaining momentum, and could have a lot of power as more schools join together in moving our economy away from a reliance on unsustainable, destructive energy. This school is filled with inspirational students and organizations that are really taking a leadership role in the fight for a just and livable world. (I’m not just talking about SMJ–Swarthmore Labor Action Project, Swatties for a DREAM, Students for Peace and Justice in Palestine, and countless other groups and students are doing great work on campus to create powerful change in the world around us.) But if we want this school to truly be a leader, it’s time for the administration to step up, meet the high standards set by its students, and take a meaningful stand on one of the biggest crises facing our generation. It’s hard for me to take Sue Welsh’s comments that our endowment shouldn’t be used for political purposes seriously when it has clear political ramifications–mountaintop removal in West Virginia, hydrofracking in Pennsylvania, climate change (Sandy is only the latest disaster) all over the world–that is effecting people RIGHT NOW, destroying homes, drinking water, lives . . . if Swarthmore really wants to be a place of social justice, a global steward, and a leader in any sense of the word, it’s time to move away from our investments in an outdated, destructive, and oppressive industry. To clarify, I (Pat Walsh) was the student interviewed for this article, and am a member of Mountain Justice. Hi Pat–I’m so sorry your full name was not included in the article. That’s a clumsy editorial mistake, and I’ve just corrected it. Thanks for the interview! We know this article’s been a long time coming; Ross spent a good while trying to get ahold of the Board of Managers, and unfortunately was unable to reach anyone for comments.